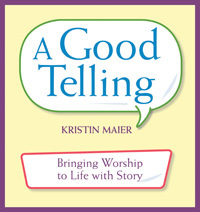 “I wish there was one good place we could go to find stories that really worked in worship services and religious education classes!” bemoaned a woman in my workshop on bringing worship to life with story. She was buying my book, A Good Telling , which has eight great stories, but what about the other 44 weeks of the liturgical year? And the other 52 weeks of the next year? Her question inspired me to create StoryInWorship.org. Each week I will introduce a new story or resource to help ministers, lay leaders, and religious educators bring quality stories to all ages in their congregations. As we go along through the year, in essence we will be building a searchable data base of uplifting, challenging, and age appropriate stories that will help young and old connect more deeply to that which we know to be holy and good. We’ve already started, with several great stories on relevant themes. Just use the search box in the right hand column. Also, check the “Featured Stories” for resources for the upcoming liturgical season. As you start looking ahead to the next big holiday or theme, so will storyinworship.org. So stay tuned! Great resources will be coming to you right here!